Found this in the IET mag. Quite a good website (if a little badly layed out) about those little plastic socket protectors. Makes me pretty grumpy that something like this only has to pass safety testing as a toy. I think the BS 13A plug is by far the nicest and safest out there and probably the only plug in the world that will always sit ‘pins up’ in order to inflict maximum damage to your foot from those machined brass edges. 15A through one of those bent metal US plugs? I’m amazed they don’t have more issues. 115V might be safer but you get awfully used to toasters and kettles running at UK speeds. Making toast in the USA is a slow process. Oh how I hate these things! They have to be the most evil of all cheap and nasty non-fake consumer electronic products out there! 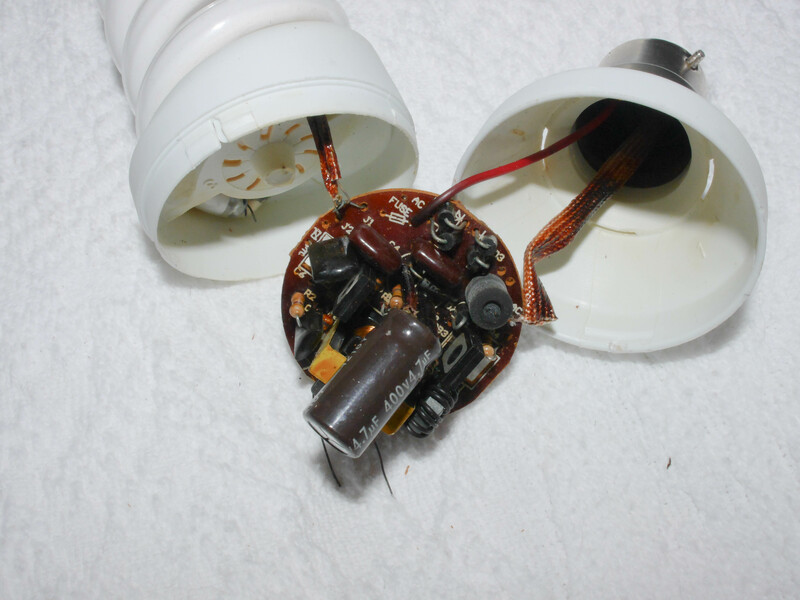 I happily accept that the humble tungsten light bulb is far from efficient and that we really do need something better, but a mercury filled bulb stuck to cheap plastic housing stuffed with the worst designed electronics known to man is not the way. Having tried CFLs in the early years and been frustrated by the glacial warm-up periods and annoyed by the gentle degradation of their light output I’d decided to ignore them. I’d gone over to using the halogen GLS replacements as they offered a saving without the problems of the early CFLs. Slight downside to the halogen GLS is if you knocked them when they were on they do like to instantly die. No good for a bedside lamp it turns out, but that is another story. 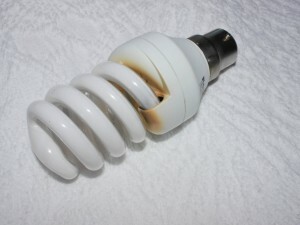 So about 18 months ago I decided to have another look at CFLs. Energy prices were going up and after managing to smack the hall light twice in quick succession while putting on my coat I was getting a bit miffed with swapping out the halogen GLS bulbs. I had a look around and bought a Kosnic Quick Start spiral 18W CFL. Well it did what it said on the box, star-up was much improved compared to 5+ years ago. Oh good I thought, save myself a good few W/hrs a day, no more dead bulbs if I happen to knock the lampshade and no waiting for it to give enough light to walk down the stairs in the middle of the night. Cut to 18 months in the future… the CFL is starting to flicker when I turned it on and its taking its time to get to full brightness. Ah heck, they still can’t make them last! I know putting them in enclosed fixtures will kill them but this lampshade has an open top so that can’t be the reason. 8000 hours? Not even close! I think one of my IET mags has an article about new lighting regs that give minimum lifetimes. Well it only lasted about a week after that. Flick the switch, darkness remains. And this is what I found when I took it out of the holder…. Wow, that has properly overheated! Brown plastic is never a good sign. This is why you should not buy cheap knock-offs, they don’t use V0 rated plastic. Anyone see the fake dyson bladeless heater that self-immolated? Upon opening the CFL the cause of the failure was apparent, 2 of the lead wires had come off the base of the bulb. They had been nice enough to shroud them in fibreglass sleeves but it didn’t help longevity. The PCB looks like its FR-2. No manufacturer or safety markings. I’m sure we have to put UL references on all our PCBs to meed CE.. Hmm.. So where do I start on this utter POS I have in my hand. 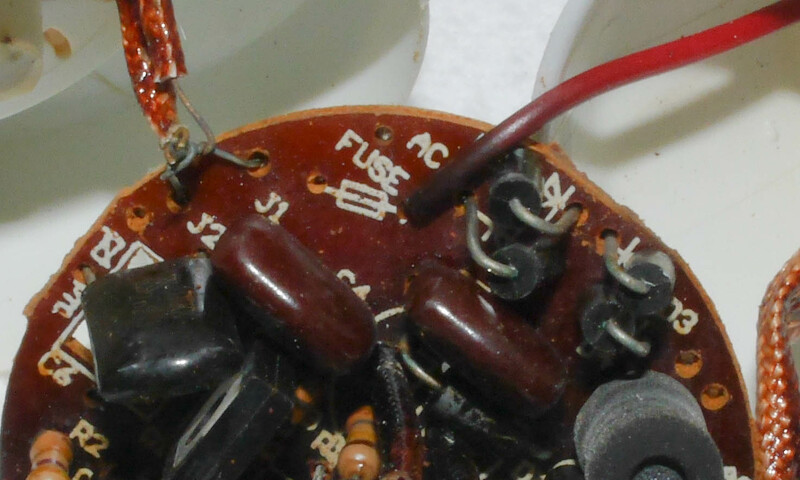 There is a PCB reference for ‘Fuse’. Well its not there! The mains inlet bypasses it. Oh brilliant! 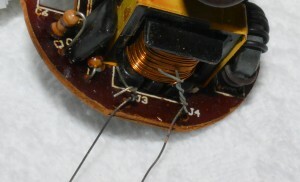 The 4 output wires going to the tube are just twisted to stub wires soldered to the PCB. Ewwww! Now admittedly I did something similar once but I was 8, I was using some bell wire I’d found and the end result was my first electric shock. So what is the future? Not CFL I hope! I now have to take this dead bulb to the dump for disposal as its hazardous. I assume it is RoHS compliant. It has the symbol (along with CE, however this passed any testing is beyond me!) but its still got mercury in it and either way comes under WEEE. I have some LED bulbs that I’ve been trying in various places. Not those nasty ones with 50 or so 5mm white LEDs. Proper ones with BIG chip LEDs. Not cheap 🙁 So far so good but they don’t really go much above 60W equiv. Colour temp is pretty good too. We will have to see about lifetimes too. I’d love to dissect one of them but only after they are dead.